When we are in the mountains we chill. We might go check out some of the touristy stuff every now and then, but mostly we just hang out. We watch movies, read books, play games, sit on the porch and watch the tourists at the store across the street. I get a lot of knitting done in the mountains. There are a few things we always do, no matter what, when we visit. We go grocery shopping at Ingles. We browse through the Mast General Store, usually a few times. We have breakfast at the Mountain House restaurant. We stop by the pet store so I can visit the birds. We play games at least one night. I couldn’t believe it! CSP & I first learned about the Beacon Drive In on the Food Network. I think it was Diners, Drive Ins, and Dives. We’ve been wanting to go there ever since. I’ve never seen Beacon Iced Tea in a store in Charlotte (and CSP is a grocery store manager so he’d know) so we were surprised to see it in a grocery store up in the mountains! I bought a bottle of the peach flavored tea and it was so yummy! The Beacon is off hwy 85 on the way to Atlanta. Ever since IKEA opened here we haven’t had a reason to go to ATL. Maybe we’ll have to make a special trip! Shannon, I grew up near the Beacon and it is well worth the drive. Plus there’s some pretty good shopping along the way. We make the trip down about once every 2-3 months, just for some onion rings and tea! Well then, we’ll have to plan a trip for sure! 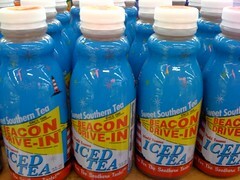 We have that iced tea at our Ingles here outside Atlanta, but I’ve never tried it. I’ll have to buy a jug sometime. Shannon, you’re in luck! The Beacon is way closer to Charlotte than you might think. It’s in Spartanburg, not anywhere close to Atlanta, which is only about an hour from Charlotte. Maybe not even that far. You should make the drive for the experience alone.